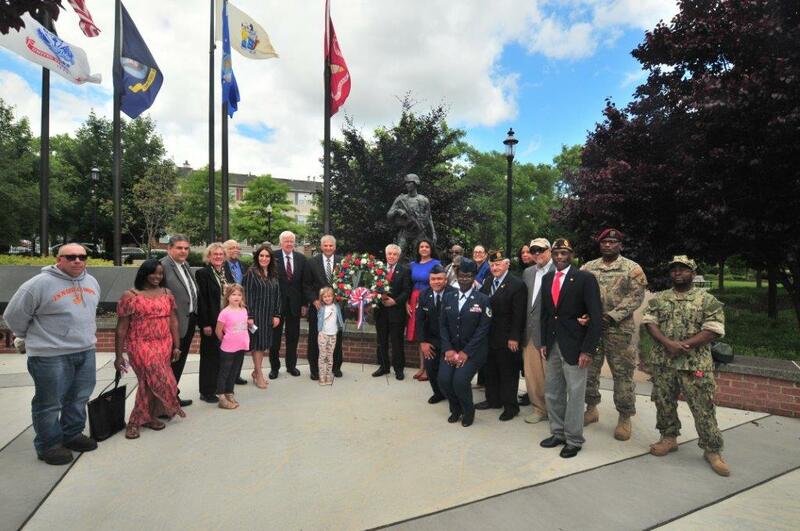 Newark, NJ – On Friday, May 26th, Essex County Executive Joseph N. DiVincenzo, Jr. hosted a wreath laying ceremony in Essex County Veterans Memorial Park to commemorate Memorial Day. Opened in September 2009, the 2.7-acre park and the Essex County Armed Forces Memorial are dedicated to the men and women who served as members in the U.S. military. It has become a tranquil place for veterans to find solace and a constant reminder about the great contributions they have made to our country. “Having this park named in honor of our veterans, both alive and deceased, is a fitting tribute to those who served in the military. This is our way of showing thanks for what they did and bringing attention to veterans and the serious issues they face when they return home. They fought for our freedom and it’s something we cannot take for granted,” DiVincenzo said. “Thank you for the special recognition for all those who gave their lives for this great country,” Newark DAV Commander Clarence Jackson said. He also shared the story of his younger brother who entered the military, which inspired Jackson himself to enlist with the Air Force. “Let’s take a moment to honor and respect the people who have made the ultimate sacrifice so we all have the opportunity to live our lives and take our liberties for granted. It’s critical that we remember the men and women who have given their lives for us,” NJ State Senator and Deputy Chief of Staff Teresa Ruiz said. “You have to be an extraordinary person to enlist in the military. I don’t believe ordinary people would do what our veterans have done for our country. They have given their lives in service to their country for us,” Assembly Speaker Emeritus Sheila Oliver said. “It’s always an honor to pay tribute to those who served, and I want to thank the County Executive for creating this beautiful park where we can salute them,” Assemblywoman Cleopatra Tucker said. “Memorial Day is not just about a three-day weekend. It’s important to keep the tradition alive to remember the men and women who sacrificed themselves for our freedoms,” Assemblyman Thomas Giblin said. “Thank you, County Executive, for recognizing such an important holiday. We will always remember the sacrifice our veterans made for us,” Assemblywoman Eliana Pintor Marin said. Sheriff Armando Fontoura remembered Jorge Oliveira, a Sheriff’s Officer who lost his life while serving his third tour of duty in the Middle East. “Jorge was an immigrant who always tried his best to be a great American. We truly appreciate his service to Essex County, to our state and our nation. He was a great American and we miss him,” the sheriff added. “Today is a reminder of the sacrifice that veterans have made for their country and the reality faced by their loved ones left behind,” Freeholder President Britnee Timberlake said. “We are fortunate that the County Executive decided to transform this site into a park. It’s a beautiful place and a fitting tribute to our veterans,” Freeholder Patricia Sebold said. “This weekend, we also have to be mindful of those who have given their lives and risked their lives for our country. We salute you for your service,” Freeholder Wayne Richardson said. The 2.7-acre park has about 400 trees, shrubs and perennials, two small meadows, the Armed Forces Memorial, walking paths and decorative metal archways at the entrances. The Armed Forces Memorial includes a circular water fountain surrounded by 10 flagpoles and a short granite wall. The flags of the seven branches of the military – Army, Navy, Air Force, Marines, Coast Guard, Army National Guard and Air Force National Guard – fly from 25-foot poles while the New Jersey State flag and Essex County flag fly from 30-foot poles and the American flag flies from a 35-foot pole at the center of the display. At the base of each flag pole on the granite wall is the official agency or government seal.